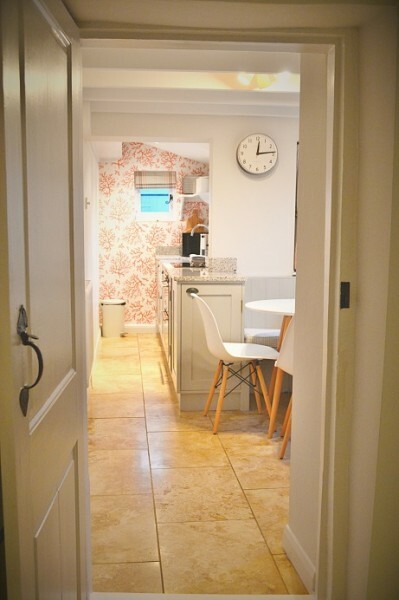 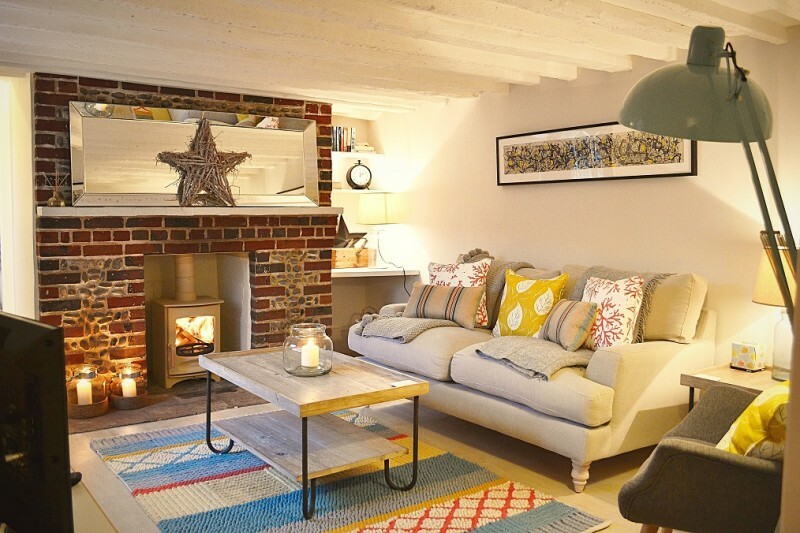 Originally built in the late eighteenth century as a single storey sail storage shed, this superb two bedroom, two bathroom, Norfolk cottage has been recently renovated and redecorated to the highest of standards by its new owners. 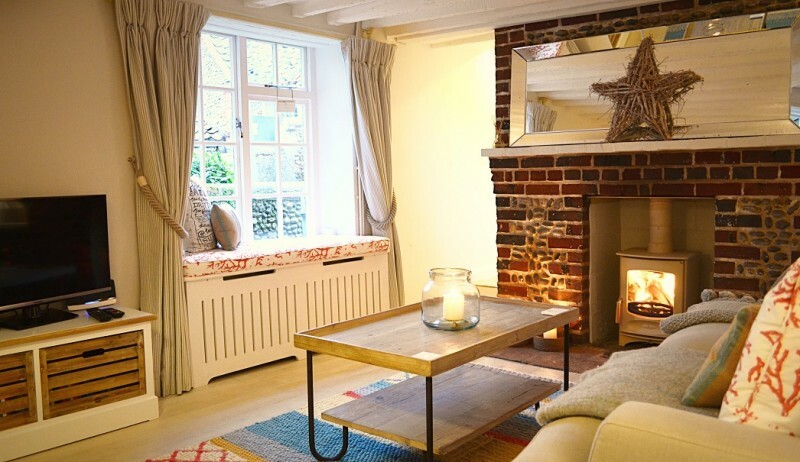 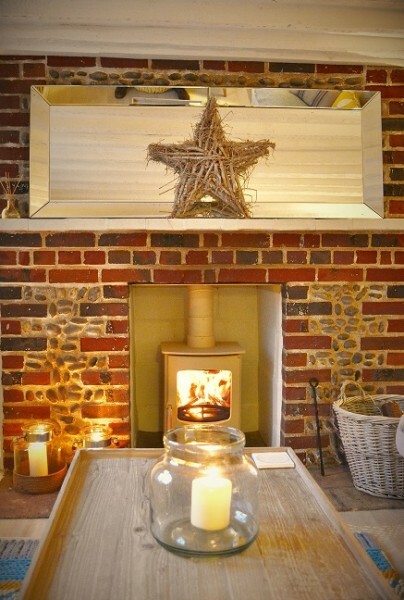 They have really made this quirky cottage into a truly special place to stay, the perfect retreat for couples or families coming on holiday to Blakeney. 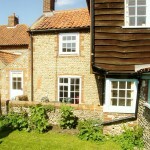 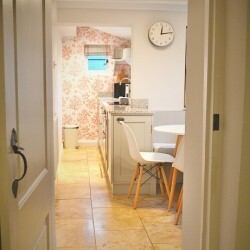 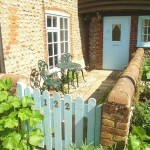 The cottage is tucked down a hollyhock lined footpath away from the hustle and bustle of the High Street in Blakeney North Norfolk. 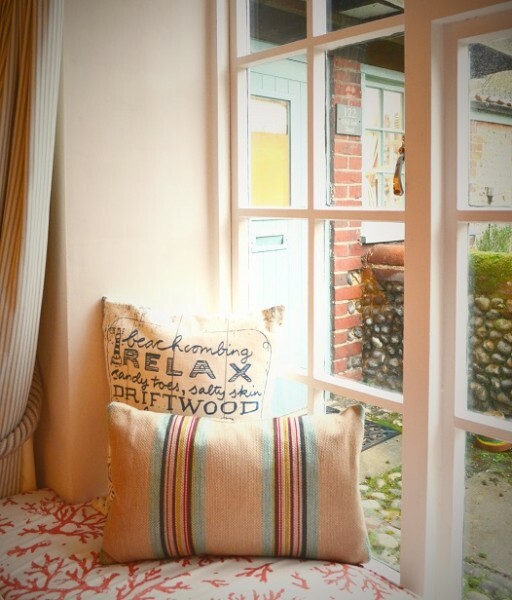 The Harbour Rooms car park is where you will be given a parking pass for which is just opposite the footpath entrance to the property. 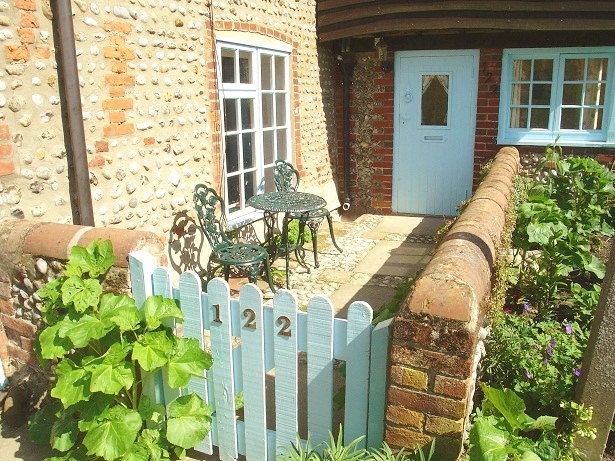 Its small, private courtyard garden gets the afternoon and evening sun and overlooks a shared lawned garden ideal for picnics – this sort of outside space is so unusual in Blakeney. 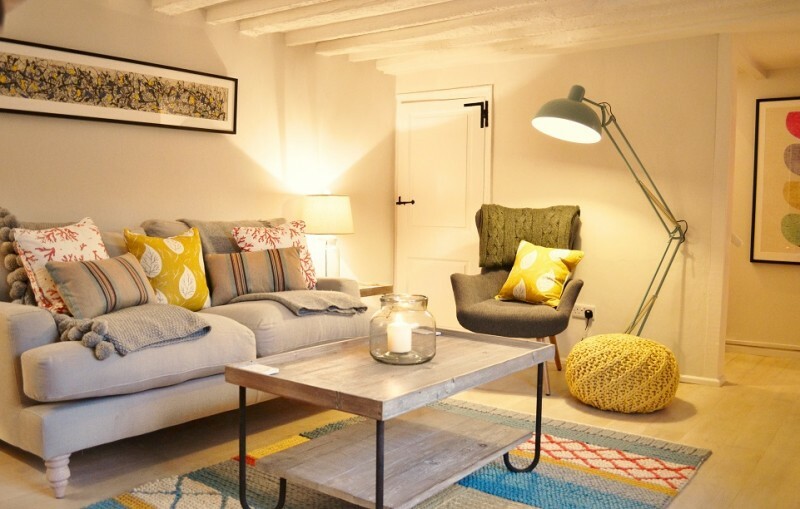 Internally a limestone floored entrance hall leads to the gorgeous sitting room with its exposed beams and whitewashed oak flooring. 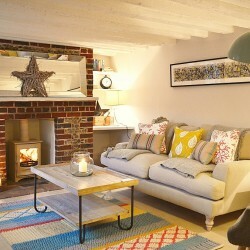 The comfy three seat sofa and retro style armchair are arranged around the cottage’s original fireplace which holds a newly installed cream coloured wood burning stove. 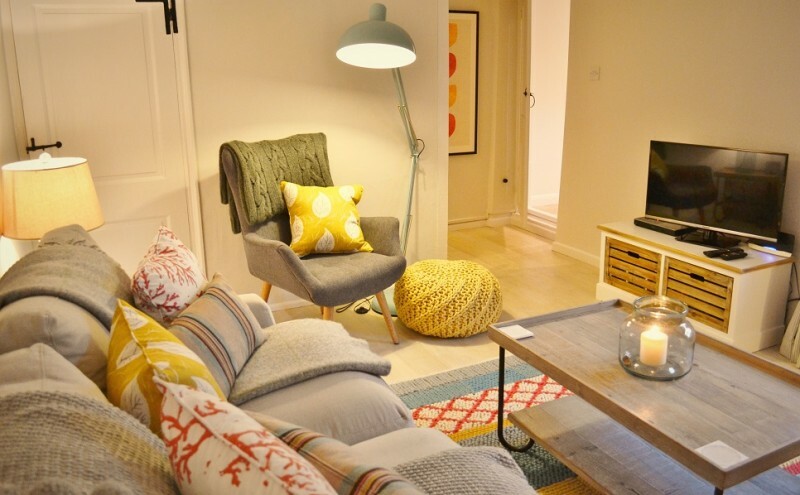 This, combined with the large LED TV with FreeSat and DVD player, makes this room ideal for lovely, cosy evenings in! 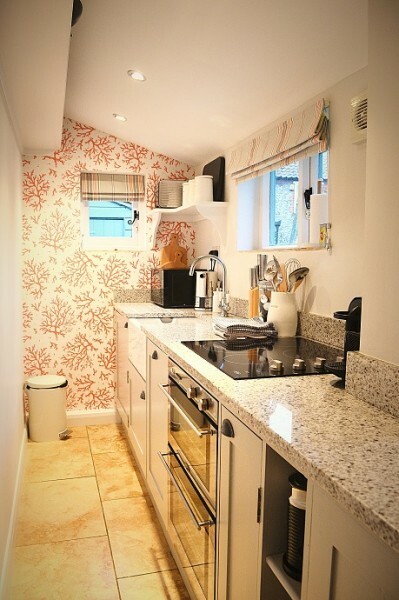 The light and bright kitchen overlooks the garden and is very well equipped with an electric stainless steel double fan oven, halogen hob, fridge, microwave, dishwasher and Nespresso coffee machine, all on or underneath luxurious granite work surfaces. 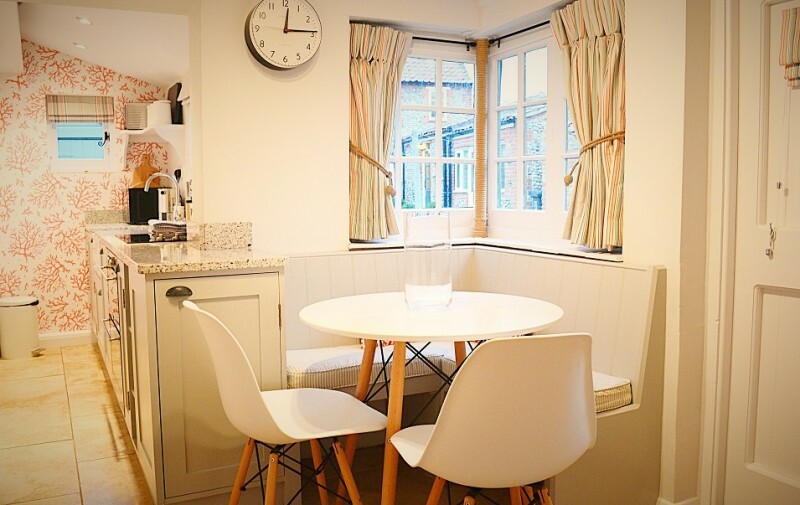 The round table and corner seating area in the kitchen offers a lovely light and airy dining area for meals. 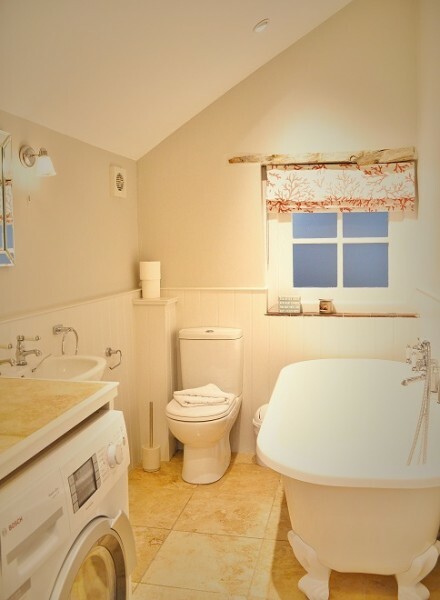 The gorgeous ground floor bathroom has a limestone floor and fabulous roll-top bath with handheld shower attachment. 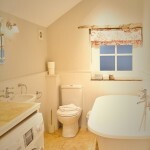 This room also houses the Bosch washer/drier. 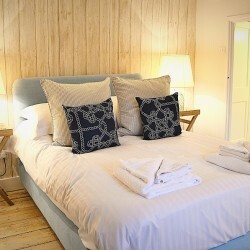 Upstairs, the stunning double bedroom is very inviting and comfortably dressed with crisp white linen. 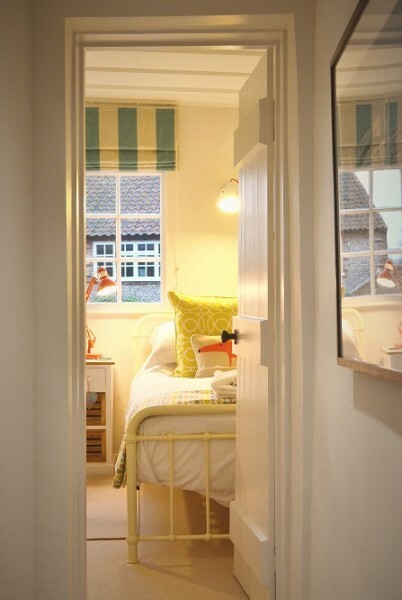 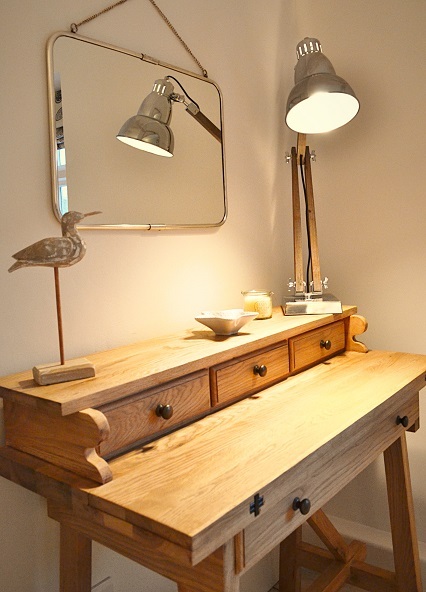 This room has plenty of storage as well as a stylish writing bureau and Eames style chair. 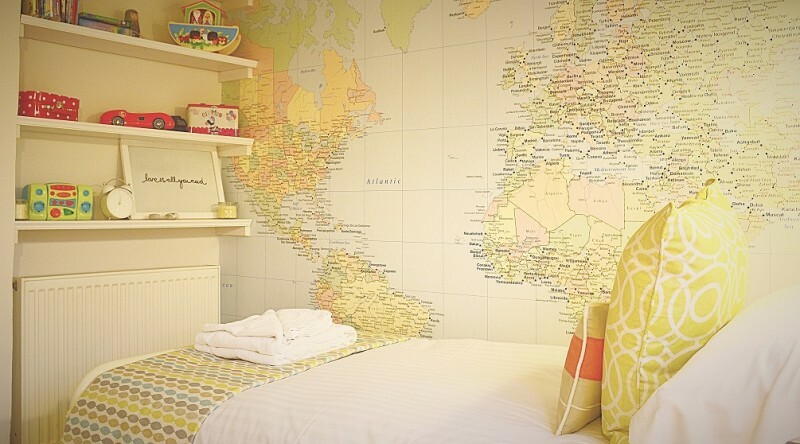 The twin room at the end of the corridor has comfy metal framed beds and has a feature wall with a huge map of the world! 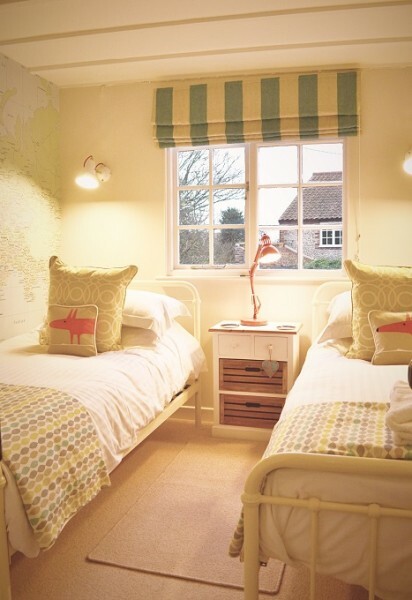 This beautifully dressed room, ideal for children, is also packed full of books and games and looks out over the garden. 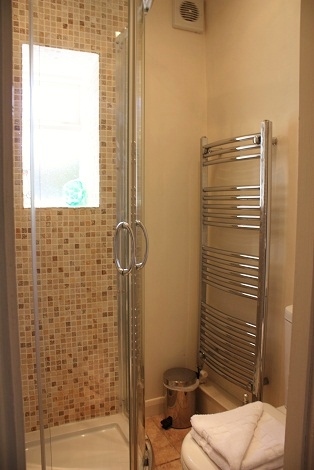 On the first floor, off the upstairs landing, there is also small shower room with a corner shower, WC and washbasin. 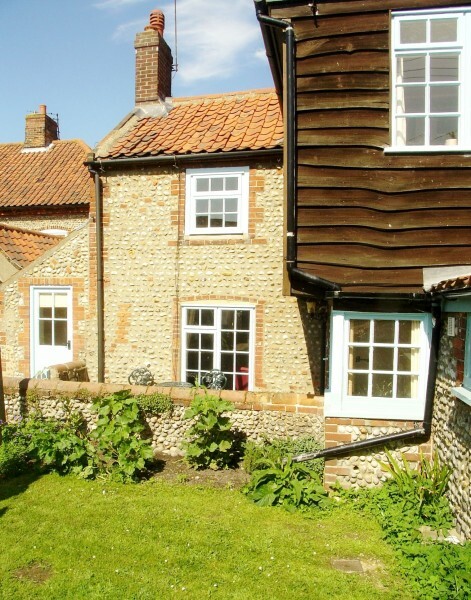 The Old Sail Shed is a truly lovely property in a fantastic location in Blakeney Village, on the Norfolk coast, away from the hustle and bustle but just a short walk from all of the village amenities. 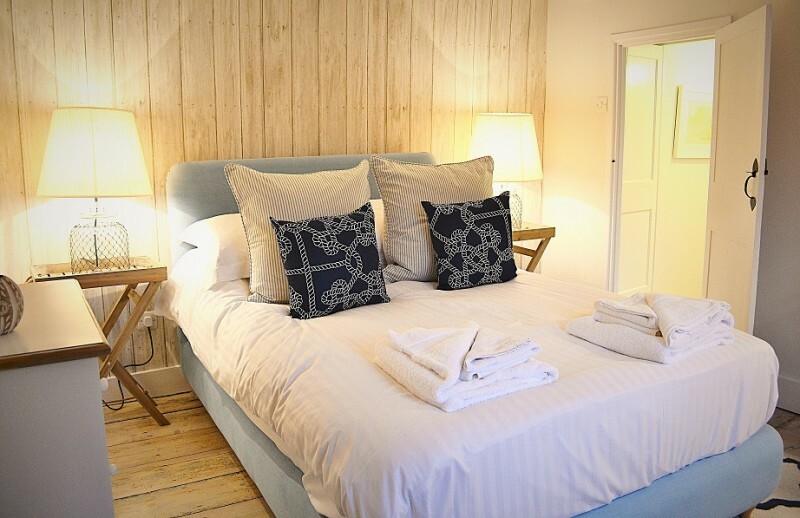 Its stylish interior offers superb accommodation for couples or families and we are sure it will be an instant hit with our discerning guests.